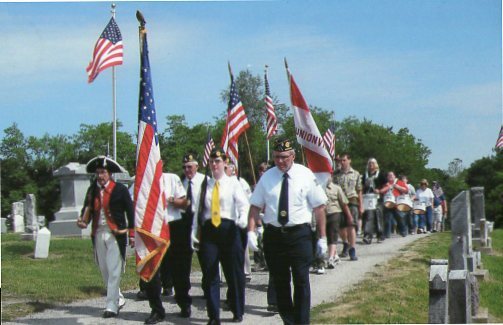 Shown here leading the Memorial Day Parade was the American Legion Post 34, accompanied by Compatriot Carold Bland, who was dressed in American Revolution uniform. Also in the parade were membersof the Veterans of Foreign Wars, Boy Scout Troop 345 and the Putnam County R-1 Marching Pride band. Compatriot Carold Bland, a member of the Corporal Braxton C. Pollard Chapter, Missouri Society of the Sons of the American Revolution, in Unionville, MO, is the oldest MOSSAR Color Guard member. Compatriot Carold Bland is also Past President of the Corporal Braxton C. Pollard Chapter.